We Help San Diego Residential Moving Customers Move Easily, Effectively and Affordably! Call Discount Movers we will help you! Discount Movers has a history of happy customers for over 20 years. Our moving company in San Diego is proud to have the highest repeat business & referral rating in the industry. As a result, regardless if you are moving to a bungalow in Coronado, a house in Rancho Santa Fe, or moving to a townhouse in Mission Valley Civita, our professional movers will make your moving day a great experience! We have an unusually high retention of employees. Many of our movers have been with us for years (4-8 years) and our Operations Manager and Assistant Manager have been with us between 15 and 20 years. Discount Movers provides the low rates and fast service for licensed, insured and experienced San Diego movers. Our services are on the preferred moving list by apartments all over the county and approved by almost all of the largest condos who require over 1 million dollars of insurance and an excellent record. 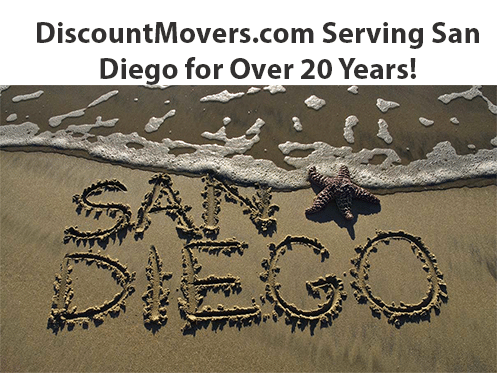 Discount Movers is proud to be a local San Diego moving company with A+ratings in the BBB and our record of 20 years of top ratings and success. Our expert movers are skilled to be able to relocate our customers in many different areas such as high-rise condos in downtown San Diego, large homes in San Marcos to historic properties in South Park and Kensington. Each type of move requires a different set of knowledge and expertise to do it well. It is very important to only look for a licensed and insured San Diego moving companies. Discount Movers is fully insured, licensed and a member of the BBB, with top ratings for over 20 years. Our moving company in San Diego offers a wide variety of moving services including full service local moving in San Diego, in addition to daily runs from San Diego to OC, LA and Palm Springs. Our team can also pack your home in moving boxes a few days before your move. If you have a U-Haul or Penske truck, we can help you load or unload your truck in San Diego. Our San Diego moving company also can help you move items into your storage unit, even if it is only a few pieces. We can also help with San Diego furniture delivery services and auction furniture moving anywhere in San Diego. Out of all the moving companies, we are proud of the fact that we have been pre-approved with the leading insurance companies. This is due to the fact that we have an excellent service history and low claims rates. Deciding if you want to buy moving insurance or not? We provide all of our customers with FREE “Basic Valuation Insurance” in protection of your move. If you want to purchase third party insurance, (which offers full replacement coverage) you can. Discount Movers only hires experienced movers who know how to move quickly, yet still being careful. As a result, your risk of damages is greatly decreased because you are working with professionals who have experience. Discount Movers has the lowest claims rating there is in the industry which is saying a lot with the volume of moves we do with the variety ranging from large homes in Del Mar, condos in UTC and beach bungalows in Pacific Beach. Caring is half the battle. Discount Movers wants to do everything possible to exceed your expectations and make your move a success! If you are in your 20s or you are hiring us to help you move your senior parents, we are here to help. We are proud to have A+ RATINGS in the San Diego BBB, and Top Ratings in All The San Diego Movers Review Sites Including Yelp, Google, Judy’s Book, Angies List, Kudzu, City Search and Dozens of Others!